Quick depth adjustment by moving a spring loaded pin, makes it the farmers "friend". 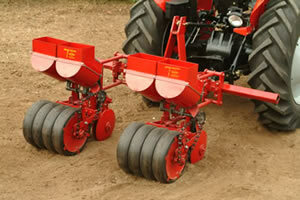 The TP-68 is available in a close-row model (MD3R shown) which places seeds in parallel rows 9" apart. Research at Alabama University Experiment Station. Headland Alabama, has shown an increase in peanut yields of about 10% when using the close-row spacing vs. standard-row spacing. 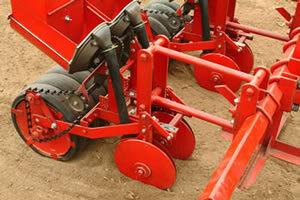 The 16" wide press wheel seals both drills and leaves a smooth surface for band spraying herbicides. 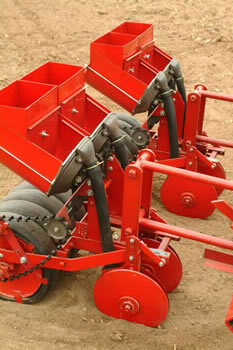 All planters sold by the row (or in this case, twin row); cultivator frames and toolbars sold separately. 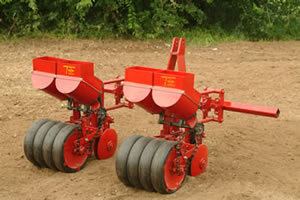 See the Products page for further information on grain attachments and other options.